If you are reading this post of your own volition, you will wholeheartedly agree that eating is such a pleasurable activity. Why then do our Indian languages use the verb/infinitive “khana” for negative and painful activities like thappad khana, maar khana, dhoka khana, gaali khana, etc.? Why don't we ever say khushi peena or pyaar khana? As if not content with that, my native tongue has a veritable arsenal of vocab for beating techniques laced with onomatopoeic adjectives. Doesn’t gaal guccha sound like some exotic sweet – some form of fried dough dipped in syrup? Au contraire, it refers to a cheek-pinch. Chaapat poli is nothing like a puran poli, but a slap in the face. A dhammak laadu doesn’t refer to a sensational besan or churma laddu, but to punching and pummeling. Sadly, these phrases do not refer to food. The only concession these euphemisms offer is that they are used mostly in juvenile contexts. But let’s not forget the grim reality that these phrases belong to the dark Dickensian world of corporal punishment and refer to instruments of physical torture. Dhapata, however is an exception. Although literally it means a whack, usually on an errant child’s back, dhapata also refers to this tasty cousin of the paratha and thepla. Never a candidate for self- punishment, this is one dhapata I have always been happy to eat! Dhapatas must have got their name from the action of patting or whacking – traditionally, dhapatas were not rolled, but patted into shape. In a large bowl, mix the chopped methi and the spices and the flours. Add salt to taste and then add the oil and yoghurt and mix it all together. Now gradually add some water to make a pliable dough out of the mixture. Divide the dough into balls the size of a large lemon. Flour a surface and roll out a ball into a small thick disc. Brush a little oil (I dot oil with my fingers) on one half of the circle and fold it into half. Repeat the brushing and fold again making it a quarter. 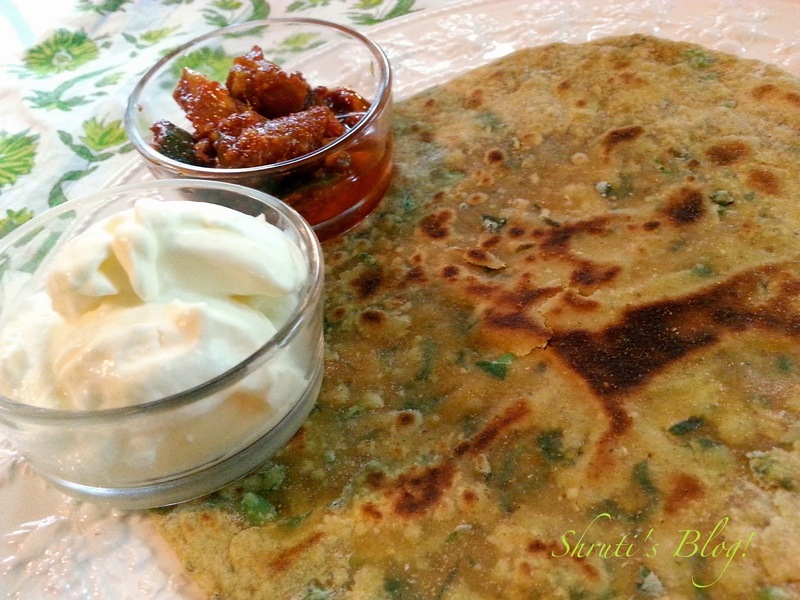 Though not very common to the rolling process of such dhapatas/parathas, this action ensures that the methi does not stick to the top and bottom of the dhapata together making it hard like papad or leathery. When the oil and remnants of the flour from the dusting get heated, they make the layers of the dhapata rise with the steam. This makes them flakey and crisp yet soft. 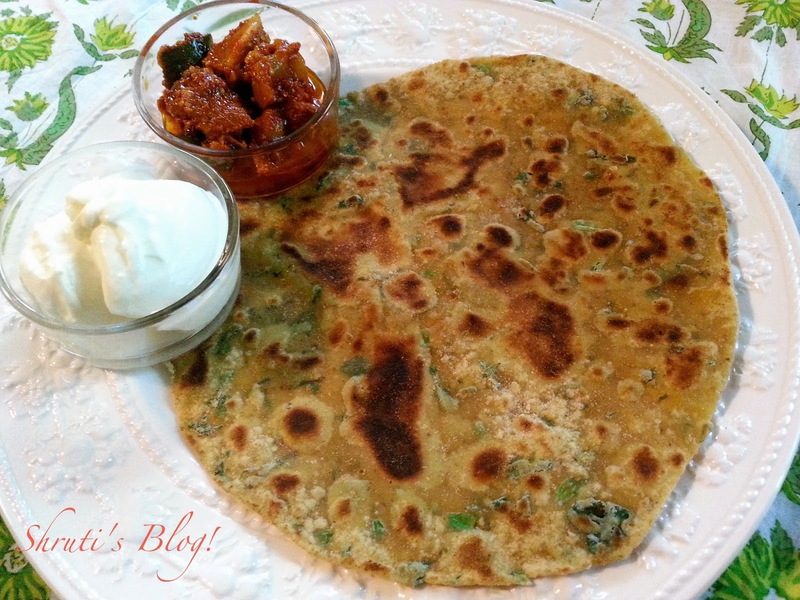 Place a rolled out dhapata on a medium hot tava. When the top starts puffing up, dot it with oil and then flip the dhapata. Reduce the heat now. Oil the side that's up and flip again after the bottom gets golden spots. This side does not need too much cooking. Remove from the tava as soon as you are happy both sides have cooked well (and the paratha has puffed up at least in parts). Leaving it for too long on the tava will make the paratha hard as it dries out more moisture from the paratha. 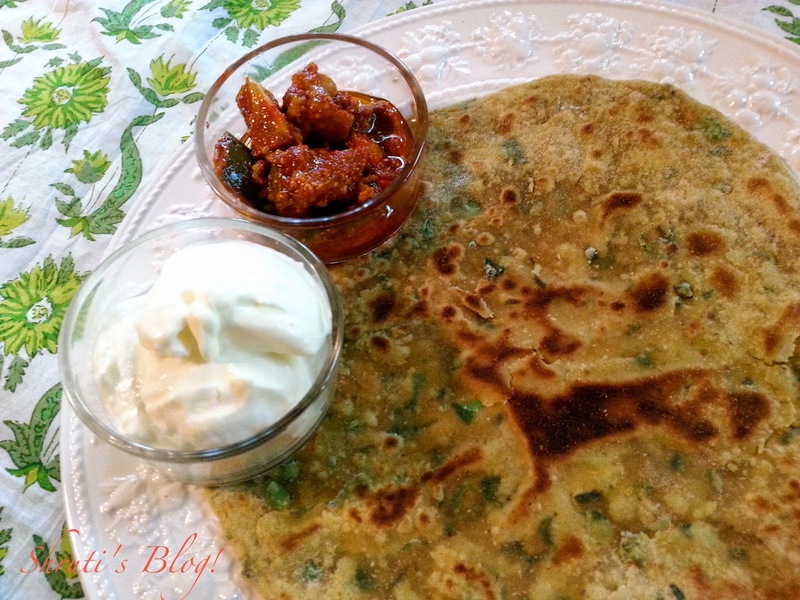 Serve the paratha hot (from the tava to the plate is the best) with yoghurt, sour cream or butter and some pickle. These dhapatas stay for 2-3 days at cooler room temperature. Store them in the fridge on hot days. They make a nice roll to have with hot chai. We often took dhapatas on long journeys and picnics, for that matter, still do.